For deep machine learning tasks needing ultra-high efficiency, our ground-breaking integrated circuit designs can be 10,000 more energy-efficient than conventional computer processors. 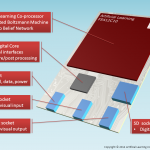 Unlike hot and heavy general purpose computers, our dedicated chip designs can help you deploy powerful machine learning in fully-autonomous mobile applications. Thank you - we will contact you soon.